Anthem AV is a Canadian company focused on delivering high quality stereo listening experiences. When one thinks of hifi or stereo systems many country generally comes to mind: Denmark, England, America as well as a few more. Anthem AV have decided to change that and fly the flag for Canada. One of their new products that we are particularly impressed with is the Anthem STR Integrated Amplifier. The revolutionary STR Integrated Amplifier is based on an entirely new technological platform, for true benchmark performance in stereo amplification. More power, more control, more connection options, and the most advanced technology available in a single, easy-to-use component. Designed, engineered, and Crafted in Canada, the STR Integrated Amplifier combines the benefits of an advanced preamp with the power of a massive amplifier and processor. It includes leading-edge DAC, onboard Anthem Room Correction (ARC™), customizable bass manager for mono or stereo sub outs, MM and MC phono inputs—far more than the average integrated amp. And it includes new generations of many of Anthem’s award-winning, audiophile-loving, review-praised digital signal processing innovations, delivering a noticeably higher level of audio performance realism. The STR comes packed with one of Anthems most significant features, ARC – Anthem Room Correction. Implements the room correction in real-time via a digital signal processor in the AVR. This process is measured and implemented when the audio video receiver is setup, this is called the home cinema calibration process. Why this is important is that it corrects the audio response of the speakers so that they accurately playback the sound intended by the movie maker no matter how your room is shaped or treated. 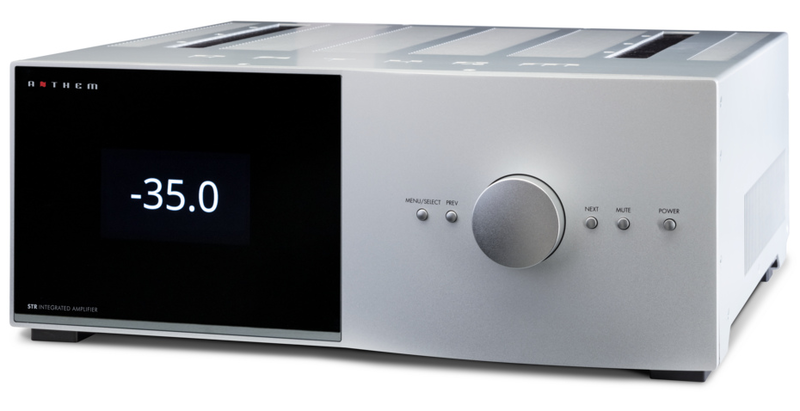 This is a stunning stereo amplifier which makes a brilliant start for any hifi system.